The Ridiculously Resilient Ridge is depicted in shades of red on this map. KQED, the San Francisco-based affiliate of the Public Broadcasting Service (PBS) released an article by Daniel Swain, a climate scientist at Stanford University working in conjunction with Northwestern and Columbia Universities on the possible causes behind the multi-year drought that has befallen California in the last few years. One primary reason for the extreme wet or dry years is what Swain called the “Ridiculous Resilient Ridge” or RRR. The RRR is a strong ridge of high pressure that has built up over the last several years off the coasts of British Columbia and Washington. 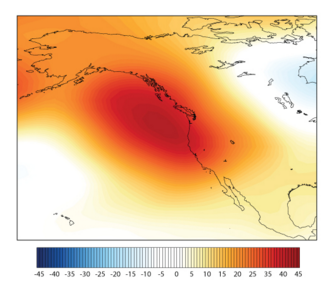 The jet stream is forced further north than what was the usual leading to unseasonably warm weather in the Northwestern United States and less precipitation in California. Additionally, it creates an extreme ridge and trough that can be seen in weather patterns in North America (as seen in the image above). The effects of this new trend has manifested in different ways: Some include severely low groundwater levels that are contributing to the mountains moving into the gaps left behind causing minor earthquakes throughout California’s Central Valley and increased water temperature in the northeastern Pacific Ocean. 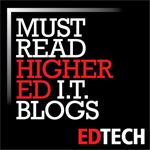 For more on this phenomenon, click here to read more of Daniel Swain’s article on KQED.com. 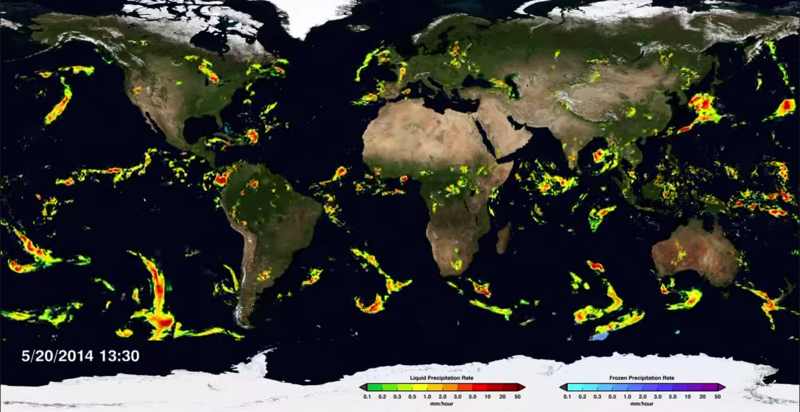 NASA released a new visualization of storms that took place in 2014 gathered from the Global Precipitation Measurement Core Observatory–a satellite network created with the Japan Aerospace Exploration Agency (JAXA)–that provides near real-time precipitation data covering most of the planet. One of the stated goals of this project is to assist emergency management teams in issuing evacuation notices with the data to back it up. Visualizations like this one are done here at CASIT through the ACISS cluster managed by our Research Support Services team. For more information about their work, please check out their website. Over the past weekend, the Mid-Atlantic, New England, and parts of Ontario and Quebec was delivered a massive amount of snow — but not as much as was predicted. 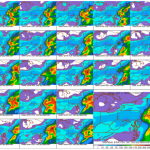 FiveThirtyEight.com posted a series of articles on that powerful storm as it arrived and departed the area and were left trying to answer why the prediction models weren’t consistent or in some cases correct. On the approach of the storm, there were four different weather models used by meteorologists to predict that New York City could get as much as eighteen inches of snow when at actually they received no more than ten (9.8″ measured in Central Park). There are multiple reasons for the variance between models like computational power for the models, the frequency and volume of data gathered, and lack of communication on the margin of error of the forecast. Additionally, CASIT’s Research Support Services (RSS) has data visualization capability for UO programs. For more information about their services and offerings, click here.